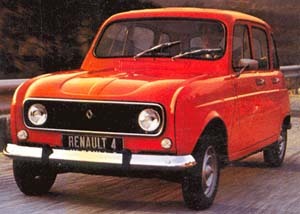 Difference between revisions of "Renault 4"
Renault 4 (R1121). 1961–94 (prod. 8,135,424). 5-door estate, utility convertible. F/F, 603, 747, 782, 845, 956, 1108 cm³ (4 cyl. OHV). Replacement for 4CV conceived as a response to Citroën 2CV, which was overtaking the Renault in sales. Soft suspension for rural buyers who might use 4s on the farm; front-wheel-drive transmission and four-wheel independent suspension. Separate chassis and body, rather than 4CV’s monocoque, for simplicity. Four-speed gearbox from 1968, the year of the 4’s facelift. GTL with 1·1-litre from 1978. Additional models added, such as fourgonette in 1962; limited-edition Parisienne in 1964 with a tartan pattern, in association with Elle magazine; Plein Air from 1968 to 1970; Rodeo from 1970 to 1987. Rebodied 4, called the Renault 6, from 1969, but the utilitarian 4 managed to outlive it. Billancourt production ceased 1987, with Slovenia the last country to put out a 4 in 1994.